As much as I a-d-o-r-e going out for Mexican food, my friends would be the first to tell you that 90% of my meal usually ends up being three things: chips, salsa, y queso. I’m a total lost cause, though, when the queso is “espinaca” — white cheese dip with spinach. Oh my heavens. This stuff is completely irresistible. I made this for our RO*TEL party this month, and all of my friends gave it a big thumbs up. So give it a try at home soon for a fun appetizer or (ahem) dinner! 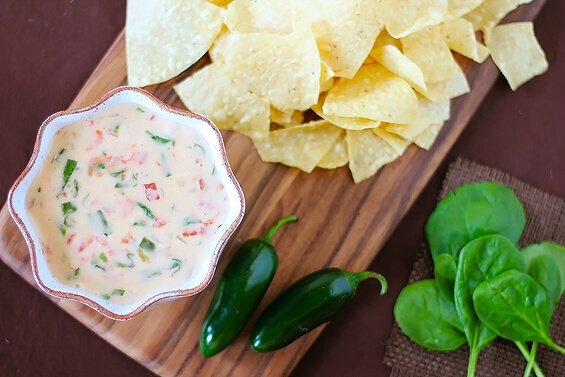 Learn how to make the irresistible white cheese and spinach dip that you LOVE at Mexican restaurants…at home! 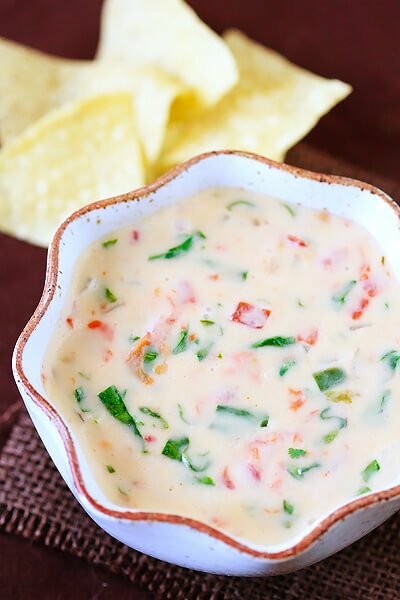 You’ll love this espinaca con queso recipe! Heat oil in a saucepan over medium-high heat. Add onion and jalapeno, and saute for 4-5 minutes until the onion is translucent. Lower heat to medium-low, then gradually add milk and cheeses. Stir together slowly for a few minutes until melted. Add the RO*TEL, spinach and cilantro, and stir until combined. Remove from stove. Pour into a bowl and serve immediately with chips. Or transfer dip to a crock-pot to keep warm. Wow! 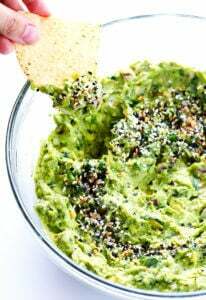 I could seriously just stay home all day and eat a whole bag of chips with this dip! 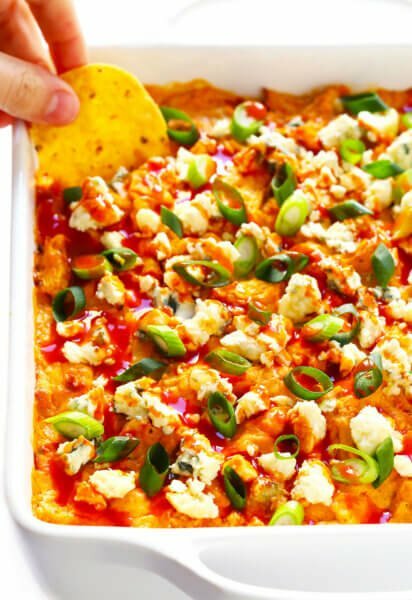 This must be the classy version of the Velveeta and RoTel dip! Um, YES. I’m taking this to the deserted island that I’m sure to end up on one day. Love, love, love this. I rarely even need to order a meal at Mexican restaurants because I eat too many chips! Love it! Oh, I do love queso! And this one looks simply delicious! A bowl of heaven for sure! Sounds delicious, I love dips. Have pinned for another day, thanks. You are welcome to join in my monthly food blogger event THE SOUP KITCHEN, here offering a new theme each month. All bloggers are welcome, hope to see you participate soon. That looks amazing and a Rotel party sounds like so much fun! 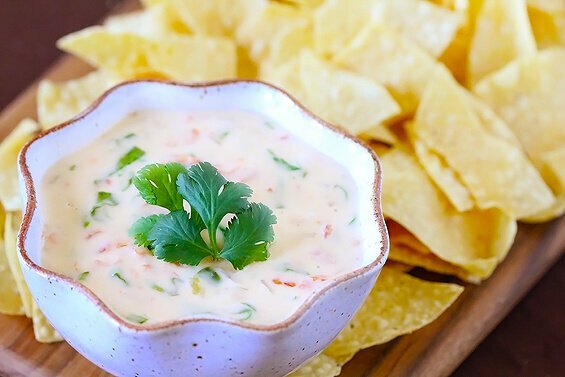 I love queso dips and this sounds fantastic! I just made this last night! So good and super super easy. I couldn’t find white American cheese, though, so I just used a bunch of american singles. Worked great! I think I would love this but I HATE HATE the grocery store. I think I’m going to try it with frozen chopped spinach that has been wrung out. Ali…this dip is awesome. I hope there is enough left to take to the party! I’m never making velveeta and rotel again! Great work. Is this like the Espinaca at Jose Peppers? That would be seriously amazing. :0) I have been trying to duplicate their recipe for years! I’ve never been able to find white American cheese. Does anyone in the KC area know where to find it? I can hardly wait to try your recipe. I am visiting my son in Oklahoma and tried some of this dip at Inter Urban Restaurant last night and I am hooked on it! Blech!!! This is one of the worst recipes I’ve ever tried! Asadero cheese doesn’t melt – it just becomes a congealed, gloppy mess. You must not have much experience with queso ( do you live in New England??). This is not queso. I wanted to bring a doubled version of this recipe to a work party. Do you think I could do the melting of the cheese, milk and veggies on low in a crock pot? Yes, I think that would work on low, especially if you keep an eye on it and stir the mixture regularly. Quesos usually require a little bit of babysitting in crock pots. :) Enjoy! I made this tonight with white American cheese and some mozzarella (because my husband thought the message said mozzarella when it said Monterrey jack;-)). Anyway, it was amazing. Even my picky kids who don’t like much green stuff ate it. I only did half a jalapeño and seeded it in hopes they would eat it. We will be making this again. Thanks for the delicious recipe! 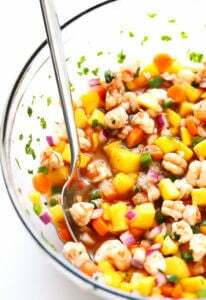 I’m making this for the second time this weekend because it’s AMAZING! Thanks for the recipe! We’re so happy you love it, Lucy! Make this often my kids love it better than “yellow” queso as we now have to deffereniate between which one I’m making when they ask. So good. Wish I could actually find the asadero melting cheese in my local stores. I gotta drive 20 minutes or more to the “right” store to get it. Longtime reader, first time poster (does that work outside of radio?) I needed to comment about this recipe. It’s absolutely delicious. I have to say that a queso recipe with American cheese gave me pause, but I put my trust in you, and it was the highlight of a Superbowl party. I have since made it many times, and it’s great. It’s rare that I don’t want to tweak a recipe a smidge, but this one needs nothing. I made it but it didn’t turn out creamy, does that happen maybe if you didn’t get the cheese in slowly enough? It had good flavor just not the texture i was expecting. Also i couldn’t find asadero and the deli counter attendants didn’t know what to substitute. So I tried fontina cheese. Oh no, we’re sorry to hear that, Roberta! :( Part of that could be attributed to the Fontina, or not adding it in gradually. is there a better alternative if you can’t find Asadero? Hi Roberta! We’ve only tried this with Asadero before, so we can’t say for sure how it would work with another cheese. However, you could try using Muenster or Provolone — they might work. We hope this helps! I have been making this for about a year, and always forget to write a comment. This dip is DANGEROUS. It’s so delicious that I could accidentally eat all of it. I had some reservations stirring in so much American cheese, but it was well worth it. I have not found a better queso yet. Thanks so much!